Pierpaolo Piccioli created graphic shapes that are as mystic as they are futuristic for Moncler. His Medieval Madonnas are inspired by space-age futurism. Pierpaolo stripped the classic duvet to the bare essence. 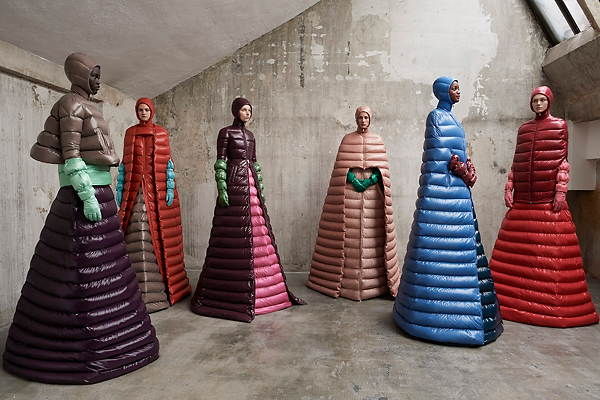 A-line silhouettes ooze a couture feel while keeping the sense of functionality which is a Moncler pillar. The collection encompasses zip-up hooded capes, both long and short, and skirts, complete with padded duvet spats and padded duvet gloves. The collection encompasses building blocks of high-impact graphic looks highlighted by contrasting bold colors. Items come in a pictorial palette of ivory, black, amethyst, imperial yellow, bright green, orange, red and cherry red. Hues are meant to be mixed rather than matched. To highlight the sense of angelic spirituality, Pierpaolo worked with monk and artist Sidival Fila, who created the abstract and angelic canvases for the installation. 1 MONCLER PIERPAOLO PICCIOLI will be available from October 11th in Moncler boutiques, moncler.com and in selective wholesale networks worldwide.